Long Length Machinable Uniforce® Clamps | Mitee-Bite Products LLC. Mitee-Bite products introduces the long length Uniforce® Clamp with machinable jaws. The long length clamping jaws give you greater versatility to machine the clamp to conform to the shape of your workpiece, enabling you to fixture difficult applications easily. The specially designed steel wedge spreads the clamping force uniformly on both sides of the 7 1/2″ (190mm) long, 7075-T6 aluminum channel. One locking plate is recommended for each drive screw when machining the clamp to your specifications (sold separately). These clamps are available in our most popular sizes (see chart below). 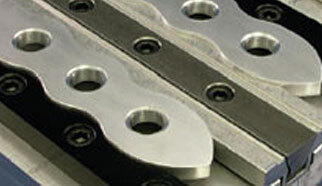 Custom clamps can be fabricated in different lengths to fit specific requirements. Channel and steel wedge are not drilled or plated. * The distance needed between workpieces for clamp clearance, drill and tap mounting holes on the center of “A” dimension. + The amount of machinable stock on jaws. ** 4 mounting screws (H) and 3 drive screws (I) included. Does not include plating or drilled holes. F+ The amount of machinable stock on jaws.